Ilegal mining in K’taka ate 2800 acres of forest land! 2800 acres of forest land is not meager amount. But the fact is that this is the extent of forest land that has fallen prey to illegal mining in Karnataka. This ironically amounts to 10 per cent of the land that has been lost to mining across the country which amounts to around 27,000 acres. The 356 page report prepared by Karnataka Lokayukta, Justice N Santhosh Hegde spells out in details this aspect regarding forest cover being ruined thanks to illegal mining. However despite submitting this report it continues to bite the dust as the Karnataka Legislative Assembly refuses to touch it. The report states that during their investigations that were conducted in the areas of Bellary and Hospet they have found at least 98 instances of encroachment and the forest land in question that had been encroached upon was around 2800 acres. During the course of the probe which was conducted with the help of the forest department, it was found clearly that acres of forest land were encroached and illegal mining was being carried out. What was even more shocking is that these illegal miners have constructed tarred roads within the forest belt. Worse the forest has been used as a dumping ground for waste material thus ruining the forest cover completely, the report also states. In addition to this, the investigating team has also found that the miners have connived with politicians and have got their job done. They have found several sketches in the possession of these miners which were not even remotely connected with the area that they have been mining in. However the report does not name any particular person or company to be behind this racket. The second probe which is underway by the Lokayukta is expected to name these persons and also the companies that have been trespassing into the forest area and carrying out illegal mining. This report even had prompted the Union Minister for environment and forests to shoot off a letter to the Karnataka Chief Minister. In his letter he had expressed regret over the inaction of the forest department in protecting its reserve forests. The Lokayukta report while dealing with illegal mining in forest does not place the blame on any particular political party. It speaks of how a former Chief Minister of the Congress with the help of officials had helped in this racket thriving. A reference to this effect was made against the former Chief Minister to the Governor of Karnataka, who in turn ordered that the state shall not proceed against him for want of evidence. Former Chief Minister and Janata Dal (S) leader, H D Kumaraswamy too speaks about illegal mining in the forest area. He however accuses the Reddy brothers to be the kingpins behind this and also relies on the sattellite imagery released by the the Karnataka State Remote Sensing Applications Centre. He says that as per these records the mining area which was around 13.5 acres in the year 1998 had shot up to 17 acres in the year 2000. Now it is 57.5 acres and there is deep cut mining activity which is on illegally. Lokayukta Justice Hegde explains that when the miners apply for a lease they are supposed to give a sketch of the area that they would be mining. During the probe we have found that the sketch of the area that is produced and the area in which they mine have no connection with each other. The probe has further revealed that the permission by these people is obtained for around 100 acres to mine. They will continue to mine in the forest areas which is well under the probibited area. However the documents would show that they are mining in revenue areas. This is the first stage of the illegality and these documents have never been cross checked by the officials. The effects of illegal in the forest areas have been disastrous. This area used to house the sloth bear in large numbers. However ever since the illegal miners have entered into this area, the sloth bears have vanished from there. Forest department officials says that this problem is large in the Sandur Reserve forests near Bellary where illegal mining is most rampant. This area used to be infested with sloth bear and today not a single bear remains in the forest area. They have either died or migrated to nearby forests unable to bear the horrors of illegal mining. In addition to this the area of Bellary has been reporting drought year after year. 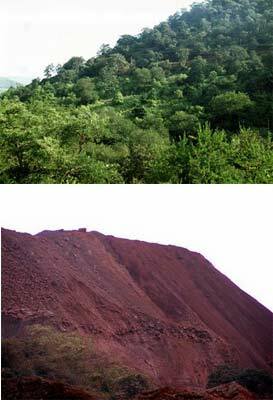 This is thanks again to illegal mining which has changed the ecological balance in the area. The entire rain pattern has changed which in turn has affected the natural vegetation in the area. The existence of medicinal plants which were in abundance too have become a rarity in this area since they have stopped growing thanks to blasting activity and also due to digging of ore in these forests areas which are marked as reserve forests. Author Vicky NanjappaPosted on July 27, 2010 November 19, 2010 Categories PoliticsLeave a comment on Ilegal mining in K’taka ate 2800 acres of forest land! Amith Shah, the Gujarat Minister for Home has his task cut out as the chargesheet against him nails him for murder, extortion, kidnapping and criminal conspiracy. The chargesheet filed in the Sohrabhudin encounter case spells on in detail the role played by Shah and the rest of the police members in the case. There is however a huge missing link in the chargesheet which the CBI would need the presence of Shah to fill up. It goes back to the year 2004 where mentions that Sorahbuddin was extorting the owners of R K Marbles in Rajasthan. The owners then contact the and sRajasthan police regarding this threat. From here the chargesheet goes straight to the Amith Shah links and mentions he ordered the killing of Sorabhuddin. The fact as to who got in touch with Shah to carry out this job is unclear and only his probe by the CBI will fill in the blanks. The Chargesheet: Sorabhuddin was an extortionist and was extorting Marble factory owners in Rajasthan. He sets up a gang with his aide Tulsi Prajapathi and even manages to kill his nearest rival Hamid Lala in the year 2002 with the help of Tulsi. In the year 2004, he hands out a threat to the RK Marbles in Rajasthan. The owners are said to have good relations with the police. During this Amith Shah comes into the picture and orders his killing. He contacts Vanzara who in turn asks Shah as to how to go about it since there is no case against the man in Gujarat. Shah tells him that this was his headache and he needed to book a case somehow and get the job done. Vanzara then gets in touch with Abhay Chudasama, the then head of the Ahmedabad crime branch and gets him fixed in a case in Gujarat. Chudasama then contacts Tusli and tells him that he has to bring Sorabhudin down to Gujarat. He then gets Tulsi to meet wit Vanzara who assures that Sorabhuddin wont be killed. He also says that there is a lot of political pressure and assured that he would just arrest the man but not kill him. Based on this assurance, Tusli gives out the details. Vanzara and Chudasama then take a Quallis vehicle belonging to a industrialist and head towards their destination. Sohrabhudin who along with his wife Kausarbhi are intercepted near Dingola. They tell Sohrabhudin to get down, but his wife insists that she would go along with him. In the meantime, they shift Tulsi to Rajasthan and an FIR which is backdated is lodged against him. Sohrabhudin is however killed and the police show the death as an encounter. In the meantime, Kausarbhi is shifted to the Disha farm and killed. He body is later taken away to Vanzaras home town at Illole and burnt and the ashes thrown in the Narmada. The chargesheet further goes on to state that in the meantime, Sohrabhudin’s brother appealed before the Supreme Court of India. At this point of time Chudasama approached him and offered him Rs 50 lakh to withdraw the case. When he refused he even threatened to kill him like his brother. 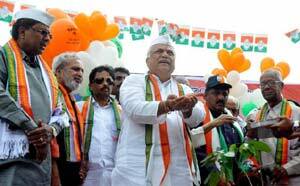 Around 2000 Congress leaders embarked on their rally Bellary Chalo on Sunday from the press club at Bangalore on Sunday. The rally is being taken out by the Congress in order to demand a CBI probe into the illegal mining scam that had rocked the Karnataka legislative assembly for over a week. The rally will last 15 days and will end at Bellary where a massive public gathering will be held. They would cover 20 kilometres everyday and the rally will pass through several parts of the state. Leader of the opposition and Congress member, Siddaramaiah who met with Governor H R Bharadwaj told reporters at the start of the rally that this was not targetted at one individual. It aimed at highlighting the failure of the BJP government in Karnataka. It was also to put pressure to initiate a CBI probe into the mining scam he said. Barely an hour after the rally commenced a 60 year old Congress leader fainted near the Indian Institutte of Science in Bangalore. He was brogutht to the hospital declared dead. Meanwhile the BJP government has decided to take out another rally starting August 2nd. The BJP says that their rally would highlight their achievements and also expose the anti people stance that the opposition in the state is taking. They would hold public meetings in Davangere, Mysore and Bellary also. The rally planned by Janardhan Reddy next month has however been cancelled. Sources told redif.com thst the BJP high command did not approve of two rallies by the same party. Moreover the Reddy brothers did not manage to get enough support from their own party members for this rally since they did not want a divisioin in the party and emergence of two power houses. The law has taken a major turn at Gujarat and it is probably for the first time that a Minister of State for Home (Amith Shah) is on the run avoiding a summons by the Central Bureau of Investigation in connection with the Sohrabuddin fake encounter case. 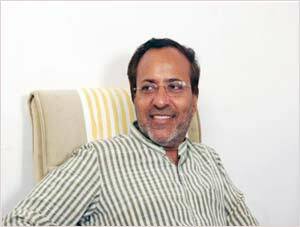 Arjun Modhwadia, the spokesperson of the Gujarat in Congress says that this is not the time to demand a resignation, but it is time for ensure that the man is arrested for such a heinous crime. Modhwadia in this interaction with rediff.com says that law has taken its own course and this time around it is end game for Narendra Modi and never again will he win an election from Gujarat. The law has taken its own course and this particular matter is seized off by the Supreme Court of India and is under investigation by the Central Bureau of Investigation. The case was initially with the CID of Gujarat and the initial record submitted to. the Supreme Court it was established that the encounter was fake. They also had sworn on affidavit to the Supreme Court that Kausarbhi was missing. Based on these revealations the Supreme Court felt that it needed to know about the larger conspiracy in the case. What I am trying to point out here is that it was the CID of Gujarat which had pointed out these facts at a time when even the CBI was not involved, so it was pretty much clear what the entire case was all about. It was also proven that there was no role from anyother party in this case. Today matters have taken an interesting turn. In the entire history of independent India it is the first and most peculiar case in which the custodian of the law and the judiciary, the Home Minister of a state is absconding from the law enforcing agencies and also the judiciary. People keep asking me about the man’s resignation. I would like to say here that resignation is a very minor issue over here. It is expected off him to uphold the law. Resignation is not a big issue here, the fact that he is absconding is. What we are saying that this man is not fit to be free. I find it shocking that no action has been taken by the government against him. I find it shocking to note that he still continues to be the Home Minister of Gujarat state. The Bharatiya Janata Party has a lot to ponder over and also to answer in this case. I want to know why no one has acted and what is the majboori the BJP has got to act against him? This case is not an ordinary one and it is a turning point for Narendra Modi. I would say that it is the last stroke for him and he would have realized that the violent tactics adopted by him have come to an end. The law has at last taken its course and mark my words, Modi or the BJP will never ever win an election after this in Gujarat. The Sohrabuddin fake encounter case has take a major turn with the Central Bureau of Investigation making Amith Shah, the Minister of State for Home of Gujarat an accused in the case. This particular case has had several twists and turns prior the Supreme Court of India directive to hand over this case to the CBI. On receipt of this letter, the Supreme Court of India treated it as a petition and the same was forwarded to the Director General of Police of Gujarat for further inquiry. The DGP Gujarat forwarded the letter to the State CID (Crime) and the inquiry was handed over to Geetha Johri, IGP, State CID (Crime). Geetha Johri constituted a team of officers who in turn visited Hyderabad, Jharnia, Madhya Pradesh and recorded several statements of witnesses of the said incident. Sohrabuddin and his wife Kausarbi on 22-23/11/2005 were traveling in a bus bearing number KA-05-AF-5051 from Hyderabad to Sangli. Rajkumar Pandiyan SP, ATS, N. H. Dabhi, PI, ATS, Santram Sharma, Police Constable, ATS, Jadeja, Driver ATS and Gurudayal Singh, Driver ATS were present at Hyderabad on 21-22-23/11/2005. Dabhi Santram Sharma, Jadeja and Gurudayal Singh started from Ahmedabad at around 1900 Hrs. on 20/11/2005 in a private Qualis car and reached Hyderabad at around 20.00 Hrs. on 21/11/2005. On 22/11/2005 Dabhi instructed Ajay Parmar to make two fake number plates for Qualis car. On instruction Ajay Parmar made two fake number plates whose number started AP-II, which were fitted in the Qualis car. On 21/11/2005, Rajkumar Pandiyan met Radhakrishnan, an IPS officer of Gujarat cadre, who was on deputation to CISF Hyderabad at his residence at Hyderabad. On 22/11/2005 Rajkumar Pandiyan was present in the IPS mess, Hyderabad along with two Sub Inspectors and five Policemen of Andhra Police and other ATS police personal named above. On 22/11/2005 Pandiyan, Santram Sharma and Dabhi started from IPS mess Hyderabad in the same Qualis with fake number plates followed by two Tata Sumo cars, wherein one car the Andhra Pradesh Police were sitting and in the other car two police personnel of Andhra Pradesh Police along with Gurudayal Singh were sitting. On 22-23/11/2005 in the night hours the Qualis with Rajkumar Pandiyan intercepted the bus bearing number KA-05-AF-5051 on Hyderabad Bombay High was and stopped it. Thereafter Policemen entered from the Qualis entered the bus and picked up Sohrabuddin and his wife Kausarbi. On 23/11/2005 Parmar arranged a farm house named Disha-Farm House, Jamiyatpura village, near Adalaj, Gandhinagar to keep Sohrabuddin and his wife Kausarbi. Two days later he was taken away by the officers. The next day Kausarbi was taken by some Policemen in a Maruti car. thrown on the road. Police Inspector Abdul Rehman from his service pistol fired two rounds, ASI Ramsingh one round, ASI Himanshusingh two rounds and PI Dabhi three rounds on Sohrabuddin. Vanzara instructed Parmar to take Sohrabuddin to the Civil Hospital. The Amith Shah angle: During the course of the hearing before the Supreme Court, it was observed that everything was going on smoothly and none of the officers probing the case faced no hurdle. However, as soon as the statements of witnesses pertaining to confinement of Sohrabuddin and Kausarbi at the Farm house came to be recorded Vanzara and Pandiyan brought this to the notice of Amit Shah, Minister of State for Home, Government of Gujarat. It transpires that Shah, brought to bear pressure on some of the officers to suspend the inquiry and also took away the papers under the guise of scrutiny.It is learnt that Amit Shah, directed G.C. 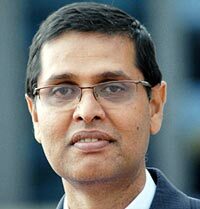 Raigar, Additional Director General of Police, C.I.D. (Crime & Railways) to provide him with the list of witnesses, both police and private, who are yet to be contacted by CID (Crime) for recording their statement in the said enquiry. Such direction of Minister of State for Home goes beyond the scope of his office it was argued. 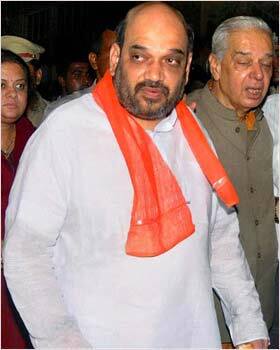 It was further submitted that Shah called for a meeting of these officials probing the case on January 30 2006 during which he tried to influence the Investigating Agency into believing that Kausarbi was not a lawfully married wife of Sohrabuddin and that she might have run away somewhere. It is reliably learnt that the Minister in course of conversation with the senior officers had admitted in cavalier manner that Kausarbi had been killed as well. It is established that Sohrabuddin and wife Kausarbi were traveling in a bus going from Hyderabad to Belgam, enroute to Sangli, on the night of 22/23.11.2005. ATS team headed by Rajkumar Pandian intercepted the bus, detained Sohrabuddin and Kausarbi along with one another. The husband and wife brought to Ahmedabad, after which Sohrabuddin was killed in fake encounter on 26.11.2005 in the morning and Kausarbi is missing till date, reportedly killed. This is a very serious matter for several reasons, the least being the fact that police force of one State of the Union namely, Gujarat traveled to another State, namely Andhra Pradesh, detained two citizens, brought them back, of which one was killed and other disappeared. This was done with collusion of police force of third State of the Union, namely Rajasthan. It brings into sharp focus the unbridled powers of the police, especially unscrupulous police officers and the safety of an ordinary citizen going about his daily routine in our society. The collusion of state government in the form of Amit Shah, MOS for Home, is by far most serious aspect of this entire sordid episode. This makes a complete mockery of the rule of law and is perhaps an example of the involvement of State Government in a major crime. Safety of the life of a citizen is a fundamental right; the constitutional implication requires to be examined in the true spirit. For the above reasons, it is recommended that the entire enquiry should at once be entrusted to the Central Bureau of Investigation including the encounter in the death of Sohrabuddin, the disappearance of Kausarbi and the death of Tulsiram Prajapati in a police encounter. It is further recommended that, CBI may be directed to constitute a special investigation team so that all facets are thoroughly investigated and culprits brought to justice as quickly as possible. It has been rumoured that the Reddy brothers of Bellary are constructing a 60 bedroom bomb proof house. This fact was however vehemently denied by Janardhan Reddy at a press conference last Monday. Whatever the truth may be, the fact remains that the rich get richer in Bellary and this is something that is echoed even by the residents of that place. Janardhan Reddy says that the focus is on him since the people are unable to digest the fact that the son of a former police constable has risen to such great heights. They make allegations against me, but I am pure like 24 carat gold he says. While in Bellary, people speak in hush hush tones about the money that these brothers have. Swanky cars, choppers and state of art campaign vehicles just to name a few. 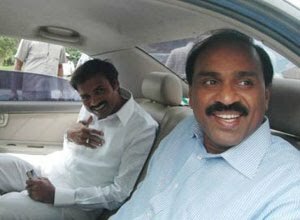 The kind of money power that the Reddy brothers have was indicated by the statement of Janardhan Reddy in the assembly last year when he said, “ people say I am worth Rs 100 crore. I want to correct them. I am worth Rs 1000 crore. The rise of the Reddys have been phenomenal. They earn anything between Rs 12 to Rs 17 crore per day through mining. They make it very clear that they do not have a single inch of land in Karnataka and the money is being earned through the Obalapuram Mining Company in Andhra Pradesh. The Reddy brothers have been in politics and mining business for less than a decade. People of the town recall that these brothers made their foray into mainstream politics only in the year 1999 when Sushma Swaraj took on Sonia Gandhi in the battle for Bellary. They moved around in motor cycles at that point of time and just seven years later, people hardly got to see them on the ground since they started using the chopper as their main form of transport. Some loyalists say that they love living in style. When you have the money you need to flaunt it, they say. Today the Reddys have in their possession two Bell choppers, a fleet of Mistubuishi Pajeros, an Audi, a Rolls Royce Phantom and a dozen SUVs. However the people say the bus that he uses for his election campaign is something worth having a look at. It is a bus that costs around 4 crore which is equipped with a bedroom, television and a kitchen. The poor: However this is just one part of Bellary. People continue to sit in their huts covered with iron ore dust watching these lords move around in style. The divide between the rich and poor is not something that anyone can calculate, people say. There are a good number of families which barely make two square meals per day. Says Siddappa, a resident of the town, “ we barely manage to make ends meet. I hear people talking about Bellary and how it is a place for rich people. I fail to understand what they mean. 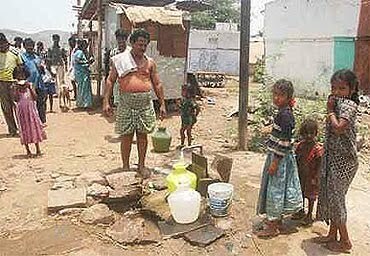 Apart from living in extreme conditions, the poor of Bellary face various health problems. The dust that is kicked up by these lorries carrying iron ore has caused asthama for a lot of people. The district hospital authorities told rediff.com that in the past one year they have treated nearly 2500 cases and there has been a steep increase over the years. Mining, especially the illegal form of it has contributed to a disturbance in the social fabric, health hazards and also bad roads. The village people complain that they are unable to sleep at nights since speeding lorries keep them awake. Lokayukta Justice Santosh Hegde who is conducting a probe had pointed out after his first visit to Bellary early last year that people also suffer from all kind of skin ailments thanks to the mining dust. He had also pointed out that the roads are in a pathetic condition over there since lorries carry more than the prescribed limit. It was pointed out that a lorry which have permits to carry 16 tonnes of ore are carrying 30. Another aspect is that since this is an illegal business, the lorries drive at very high speed which have only added to the accidents. There are around 4000 trucks which carry iron ore to the nearest Belekeri port everyday. This contributes to a lot of load on the roads and gives the people sleepless nights. The social fabric is another thing that is being disturbed. The lure of easy money has kept the youth away from studies. Illegal mining lords have lured the youth with fancy bikes and easy money to take care of their business. The people allege that youth prefer to earn Rs 15000 per month and travel on fancy bikes with free cell phones instead of working for it and taking up a job which may or may not pay that much. First they slept in the assembly for nearly a week and today they will walk the roads of the state. It is time for Yatra politics in Karnataka. The first of the Yatras will commence on July 25th and this would be undertaken by the Congress which is in the opposition in Karnataka. Congress leader Siddaramaiah who will lead the yatra informed that this Yatra is aimed at exposing illegal mining in Karnataka. Moreover it aims at stopping the looting of the natural resources in Karnataka. The rally by foot will commence at the Freedom Park in Bangalore and will end at Bellary where a huge public will be held on August 9th. During the rally the district bearers of the party and also the general public from various districts will join them, he also informed. In order to counter the opposition and tell the people their version of the story, the Reddy brothers will also take out a rally commencing at Bellary. This rally which is scheduled to commence on August 20th will have BJP leader, Sushma Swaraj in the lead. Janardhan Reddy had announced on Monday that they need to tell people their version of the story and they will also expose the Congress during this rally. The rally will end at Mysore which is the stronghold of Siddaramaiah. However there appears to be a minor skirmish within the Bharatiya Janata Party regarding this rally since on August 13 the Chief Minister, B S Yeddyurappa would like to undertake his rally of 30 districts. This matter had even reached the high command and is currently being sorted out. Yeddyurappa feels that the Reddy brothers should not undertake the rally since it would give an indication that there are two power houses within the BJP. However this time around the MLAs appear to be united with the CM since they feel that the rally to be undertaken by him would have more importance. The CM had made it clear that he would visit all thirty districts in Karnataka in the wake of the Taluk Panchayat and Zilla Panchayat elections. 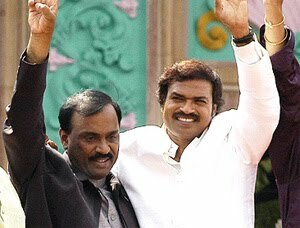 Sources within the BJP told rediff.com that the CM and BJP chief Eshwarappa have refused to take part in the rally by the Reddy brothers since they feel that it is not the time to wage a personal war with the opposition. Instead the party must stand united and join the CM in his rally to win the trust of the people for the forthcoming local body elections. While raising contract is the primary concern surrounding illegal mining, there is another interesting aspect which contributes to this multi crore racket. The Lokayukta report and also the Advocate General of Karnataka had clearly mentioned that to bring about a halt to illegal mining in Karnataka there is an immediate need to check raising contracts and in addition to this keep a tab on fake transport contracts. The officials of the Lokayukta have seized large numbers of fake permits which were being used to transport iron ore. As investigating officers would put it, these are permits with no expiry dates and have been used over and over again. The lid on these fake permits which are used for transportation and also export was blown off when a team of investigating officers were probing the infamous Belekeri port incident. The Lokayukta team had seized 5 lakh tones of iron ore being transported illegally from the port and overnight the same disappeared. Following this mysterious disappearance of seized ore, investigations were conducted and some shocking facts came to light. The rules clearly state that once iron ore is dumped at a port, the port officer has to return the permit with a cancellation seal. However in several cases including this one, the investigators have found that none of the permits had been cancelled the same permit was being over and over again. Another clear violation which has been noticed by investigating agencies is that no fresh permits were being used for the transport of ore. Each load is to be accompanied with a permit of the forest department and also one from the mines and geology department as per Section 162 of the Forest Rules. However what the investigators found that is that these were all old permits and none of the permits provided by the port officers even tallied with the amount of iron ore that had been exported. Lokayukta Justice N Santosh Hegde pointed out that the irony is that these people have managed to get past 12 check posts before dumping the ore at the port. We are getting into the bottom of this and are also trying to find out as to why not a single case has been booked against these officers who let the ore pass in the first place. 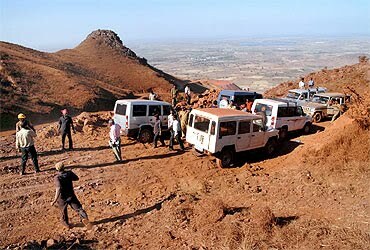 K C Kondaiah, Member of the Legislative Assembly from Bellary who has filed a petition before the Karnataka High Court regarding illegal mining told rediff.com that these fake permits are used to carry out illegal mining. The lorries carry 30 tonnes of iron ore when the capacity is just 16 tonnes. They use the same old permits and get past the check posts. More importantly these permits are accompanied with a chit which is an indication that the lorries must not be stopped. The charges that these people pay the lorry drivers is also Rs 200 more per tonne when they overload the lorry and in Bellary they call this exercise as “Risk Management.” He also alleges that in most occasions there is the use of Andhra Pradesh based permits with this ore from Karnataka is being transported into the Krishnapatanam, Vaizag, Belekere and Kakinanda ports. From here the loot is taken to Chennai and then out of the country. The Lokayukta probe also found the use of permits from Andhra Pradesh which were being used to transport ore from Karnataka. During a recent raid, the Lokayukta squad also found photocopied copies of permits which were being used by mining companies. This was found to be used majorly in the Bellary-Sandur belt of Karnataka. Sources in the investigating agency told rediff.com that it was not some small time seizure. We have found 8 gunny bags of such permits and this is what is contributing to the big scam in this business called as transport contracts. Further to this, the Lokayukta is also probing to find out whether fake permits are being printed. There have been some complaints that this racket is being going on in Hospet near Bellary and are being used to transport ore illegally. Rules flaunted: Ask any investigating officer looking into this issue and he would say that there is not a single rule that is being followed. These lorries which carry fake permits are always accompanied by goons of these mining lords. The Lokayukta report makes a mention regarding this aspect in which also goes on to state how the social fabric of Bellary is being spoilt due to this. Mining lords have picked up several unemployed youth and have provided them with fancy bikes. In addition to this they are given food, Rs 500 per day and also a mobile phone. Their job is to make regular trips in the town and also on the highways apart from accompanying these lorries. Their job is to inform the higher ups in case of any trouble. In addition to this investigations also go on to show that rules are not being abided and not a single officer in the check posts have been able to control this menace. The Forest Rule 162 mandates that no forest produce shall be transported without a valid pass or permit which is attested by a seal. After verification of the document a cancelled seal is to be fixed on the document which means a fresh permit has to be obtained for the next export. However the investigations during the Belekere incident have shown that these permits are not being cancelled and hence the mine owners are able to use it over and over again. The mining issue has taken centre stage and it appears to be going out of control since both the ruling BJP in Karnataka and the opposition are at logger heads. While each one is engaged in mud slinging and accusing one another of being the bigger scam king, the Advocate General of Karnataka who has a lot to do on this issue says that the biggest issue is that Karnataka has iron ore for another 25 years only. Advocate General of Karnataka, Ashok Harnahalli says that it is necessary to expose the mining scam, but the primary concern of the Government of India should be the iron ore which is fast getting over. 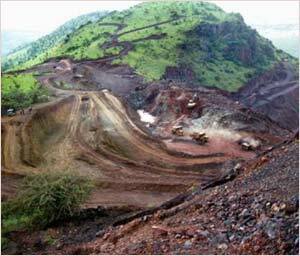 In this interview with rediff.com, The Advocate General speaks about the mining issue and what needs to be done to tackle it. Like the Governor, you too are a constitutional authority. Do you think Governor, H R Bharadwaj has exceeded his brief on the mining issue? The Governor does not have a role in this since there is no break down of law and order. I would not call it exceeding of brief. He has just acted over enthusiastic. What about the demand for a CBI probe into the matter? Are you in favour of it? The opposition in Karnataka should realize that the union government cannot order a CBI probe suo motu. There needs to be a consent from the state government and I think that there is no need for a CBI probe. Isn’t the Lokayukta looking into the matter? Let us wait for his report and then see what needs to be done. The state is very serious about tackling this problem and I can vouch for that. Why is everyone asking for a CBI probe then? Don’t they have faith in the Lokayukta? I fail to understand this aspect. Earlier when he put in his papers the same opposition screamed that the state has lost a good man. All of a sudden they feel that the probe will not be fair. Doesn’t that amount to double standards? The opposition has not doubted the intergrity of the Lokayukta. All they have said is that there is a jurisdictional issue since the mining menace spreads over two states. The more important thing at the moment is to prevent ore getting out of the state illegally. The Lokayukta is well equipped to take care of that and he will do that do. It is too premature to seek a CBI probe at the moment. In case the report by the Lokayukta is adverse in nature or if the issue of boundaries does become a problem then let us consider a CBI probe. But at the moment it is too premature. Precaution is what needs to be taken at the moment. If the state government is so very concerned then why doesn’t it ban export of iron ore? Why is the state government being blamed for this? The state has no powers to ban the export of iron ore as the power is with the union government. The new amendment to the act seeks to ban export of ore for those who get fresh licences. For the existing mine owners a ban on export can only be imposed by the union government. You asked me why the state is not serious. You mean to say the Union government is? Why have they not banned it in Chattisgarh where mine owners are looting the natural resources. Are you even aware that the union government is sleeping over this matter over there which has given rise to the naxal movement? There is an allegation that the government claims a meager royalty from existing mine owners. Why hasn’t the state brought about an amendment to this effect where it can earn more from legal mining? Royalty is being paid on the sale price. 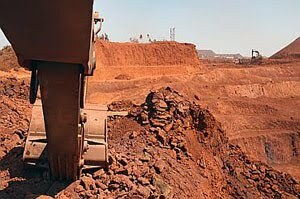 The Indian Bureau of Mines has fixed the royalty at Rs 1,000 per tonne of iron ore when the actual price per tonne is Rs 3000. What is worse is that ore is being sold above the sale price at Rs 5000 in the market since there is so much demand. Now the state government does not have any control over the royalty since it is the job of the Indian Bureau of Mines to fix it and this body comes directly under the purview of the union government. You see what I mean when I say that the Union government is an equal party to this racket. Why cant the High Court interfere in this matter since none of the government appear to be doing anything other than blaming each other? Someone will need to move the court and prove before it that the problem is really big. If the court is convinced then it can act provided it feels that this is an extraordinary circumstance. When we look at the statements that are being issued, one gets the idea that none are involved in mining in Karnataka. If no one has a stake then who is doing this? Yes it is a strange situation. What needs to be taken into account is the issue of rising contract and transport contract. What has been noticed even by the Lokayukta is that people are obtaining mining licences but do not mine. They either hand it over to some other party due to force or sometimes out of their own will. This is a rising contract which is illegal and needs to be looked into. If this is not banned immediately then you will never be able to fix the real culprit. There is also another issue of transport contract which also needs to be banned. Basically the owner of the lease has to mine the area and also transport it and he should not be allowed to hand over the operation to anyone else in the form of a rising or transport contract. It has been termed as black gold? Why is there such demand in the international market? The very fact that there is such high demand is because there is very little of it. This is our natural resource and we cannot part with it. We should not sell away our wealth. I will not be able to give a nation wide figure to this, but as per our records, Karnataka has iron ore left for another 25 years only. After that we will have no option but to beg in the international market. What is the government doing about the Belgaum issue? I don’t see any issue at all. The Mahajan Commission was very clear that it is a part of Karnataka. We have been given eight weeks time by the Supreme Court to file our reply and we are working on it. Mining scam: Is raising contracts the root cause? The job of any investigating agency that will be looking into the multi crore illegal mining scam in Karnataka will not be an easy job. The interesting part is that every party has come out in the open and blamed each other for this scam which has made every citizen wonder who is responsible for the multi crore scam. The various documents which have been trickling in since the past couple of days when read with the probe by the Lokayukta, Justice N Santosh Hegde go on to reveal that it is the issue of raising contract which makes it hard to probe such a case. Advocate General of Karnataka, Ashok Harnahalli in an interview with rediff.com on Tuesday too had pointed out that raising contracts are the biggest hindrance to this probe and there is a need to ban it immediately. Documents would go on to reveal that out of the 80 odd mining leases in the Bellary region, at least 45 are raising contracts. What is a Raising Contract? Though the title `Mineral Raising Contract Agreement’ is termed illegal in the mineral rule book, it has become an unwritten rule came into effect of late in multi-billion worth Bellary iron ore mining business. The irony however is that the raising contractor manages to get a major share of the profit which amounts up to 80 per cent where as the actual owner is left with the remaining amount. Lokayukta Justice N Santhosh Hegde says that this is an unwritten rule mainly in the Bellary area. The rule book clearly mentions that raising contracts are violative of Rule 37, 37A and 46 of the Mineral Concession Rules and contrary to the covenant of clause 17 and 18 of Part VII of the Mining Lease deed. The statements that have been obtained from some of the mine owners which are part of the ongoing investigation into illegal mining go on to reveal that third parties or the mining lords force them to enter into such a contract. On most occasions they are threatened to hand over the lease. One such mine owner who has handed over his contract told rediff.com that he was forced to hand over the lease. I am too afraid to take names but they had said that they will ensure that there will be many hurdles if I undertook mining operations by myself. Justice Hegde says that the living conditions in Bellary are extreme thanks to the weather. Most of them don’t want to live over there and cannot operate the mines and hence they part with their leases. Officials say that raising contract is an unwritten rule and there is no documentation to this. Even though this is illegal it is very difficult to proceed against them since there is no documentation to this. The Lokayukta report states that there are nearly 40 such contracts. There is an interesting annexure to this report by Dr U V Singh, a senior Forest officer in which he mentions that the Obulapuram Mining Company which is incidentally owned by the Reddy brothers, Janardhan Reddy and Karunakar Reddy has allegedly encroached Karnataka land. The annexure says that the OMC has allegedly entered into an agreement with Hind Traders through a raising contract and in the bargain has altered the border. Investigations show that the profit alone made by the raising contractors per day is Rs 17 crore. When one calculates the amount that is being mined from the 45 mines (1.80 lakh tonnes per day) which are handled by raising contractors it shows that they earn Rs 39 crore per day. After exclusion of the duty, taxes and other expenditure the raising contractor is left with Rs 17 crore per day of which he parts with 20 percent to the mining owner. While this is what they earn legally, there is also the added money that is being earned through illegal mining which preliminary reports suggest could be twice the amount. The money earned from illegal mining goes directly to their pockets and there is only the expense of labour and transport is what they have to shell out. It may seem like an impossible situation to investigate. The Reddy brothers have openly challenged both the Congress and the Governor to show that they own even an inch of mining land in Karnataka. Justice Hegde however says that it is not an impossible situation. Maybe there are no documents to show that people have entered into a raising contract. The start of such a probe may be difficult, but then we have the power to interrogate. We are aware that almost 90 per cent are raising contracts in the Bellary area and we are getting to the bottom of it. We have seized several fake permits and we have to put two and two together and join the dots. Under no circumstance will anyone get away scot free. I have also been watching the developments over the past few days where all the parties are making allegations against each other on this issue. This is a good sign and we will summon for documents from each one of them and will use it as a lead to the investigation, Justice Hegde also pointed out. Author Vicky NanjappaPosted on July 20, 2010 November 19, 2010 Categories PoliticsLeave a comment on Mining scam: Is raising contracts the root cause?